Picture this: you’re packing for your summer vacation. You’re trying to pick the ideal shoe – something you can wear sockless while carrying your towel bag down the rocks to the beach, but something that also works in the evening when you put on a jacket and trousers – or even a suit. What you want is a white canvas sneaker. Before you accuse me of telling you lies, let me assure you that wearing sneakers with a sport coat is a fine thing to do, and it’s pretty common in places that aren’t the USA. Arianna tells me that she can remember seeing Fiat managers wearing sneakers with their charcoal and navy suits, and of course sneakers are all over Pitti Uomo. You don’t have to go full-on captain of industry or Pitti peacock-hashtag-menswear to make the sneakers work, though – you just have to avoid the pitfalls of looking like a Disney star or a child playing dress-up. Let’s talk about those pitfalls first. If you’re going to wear sneakers with a sport coat or a suit, and you’re after inspiration on how to do it, the first images you’ll find on the internet will probably be of either actor-slash-model types standing on the red carpet wearing really tight clothes and designer high-tops, or waifish Scandinavian dudes wearing black suits with white leather slip-ons inside their million-dollar Youtube-content-creator-slash-graphic-design-influencer offices. The point is, a lot of people try really hard to build their tailored outfits around the sneakers they’ve chosen. Along the way, they often pick up a few more trends – really tight trousers, gingham shirts, skinny ties – and this has the effect of making them look, well, childish. Like they’re playing dress-up. That’s not what you want! What you want is to wear sneakers with a jacket and trousers and look like a well-dressed adult. So, instead of sizing down on everything you own, treat a pair of canvas plimsolls the same way you would a pair of loafers or espadrilles. Wear them sockless, with a lightweight trouser that’s hemmed at the ankle (or even just above, if you’re really feeling the warm weather look). 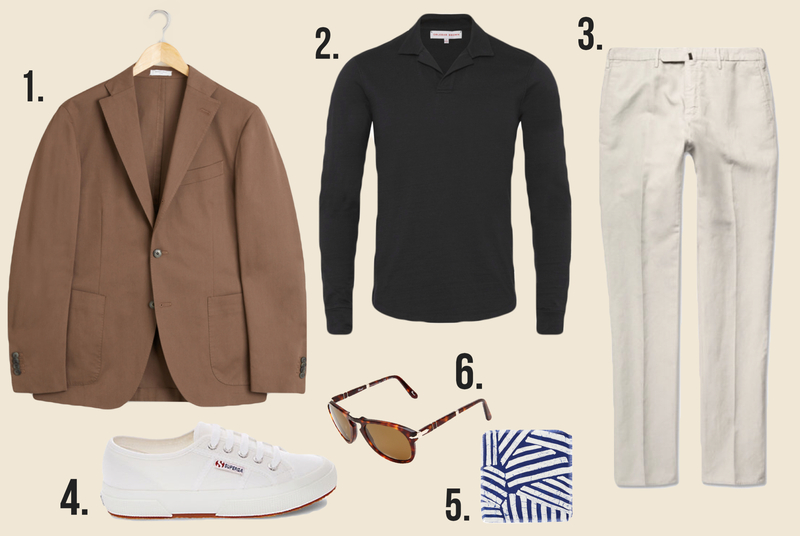 If you’re wearing a suit, it’s probably safest to go with one that’s obviously made for the warmer weather – say, a cotton number in khaki or even green, or natural linen if that’s what you’re after, but an odd jacket and trousers will work just as easily. There’s no need to buy something fancy, either. In fact, that sort of goes against the intent. White canvas plimsolls from brands such as Vans or Superga will look great, but if you’re really wanting to branch out you could try a leather slip on from Common Projects or Buttero. In all cases, stick to low-tops. Once you’ve picked your sneakers, the next and final step is to put them on your feet and never think about them again. After all, you’ve a life to enjoy. This entry was posted in Style and tagged chukkas, loafers, shoes, sneakers, summer style by Jasper Lipton. Bookmark the permalink. I wore white leather sneakers, Levi’s and a DB blue blazer in the late 80’s when traveling. Great for travel.